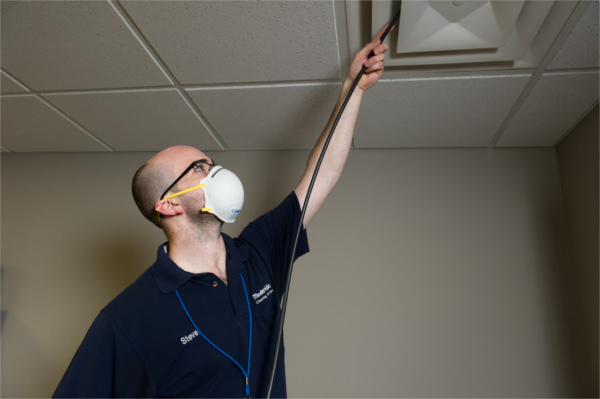 What is air duct sanitizing? While you may know the health and cost benefits of air duct cleaning (like allergy relief and lower energy bills), we’ve found that many people don’t know the benefits of air duct sanitizing. So, what does air duct sanitizing do? Air duct sanitizing is an additional service the certified air duct technicians at Modernistic can provide while cleaning your home. After cleaning the ductwork, while your HVAC system is still hooked up to the air duct truck and under negative air pressure, they apply the sanitizer. The technicians use a fogger to apply the sanitizer and due to the negative air pressure, it coats the entire interior of the duct system. The product has no lingering scent and is safe enough that it is used in hospitals. How is it different than air duct cleaning? What’s the difference between a standard air duct cleaning and sanitizing the ducts? A standard air duct cleaning removes any debris from your ductwork such as dirt or drywall dust. The sanitizing adds the disinfecting and deodorization of the ductwork of your home while killing any mold or mildew hiding inside. In addition, it prohibits bacterial, viral, and fungal growth for approximately six months after being applied. Why should I have my air ducts sanitized? There are lots of situations where you and family might benefit. If you are moving into a new home, sanitization can make sure that any unknowns from the previous homeowner are taken care of. It can also help during the winter months by minimizing the germs your HVAC system is spreading through your indoor air. Sanitization further assists with removing any triggers for you or your loved ones who suffer from allergies or asthma. Killing any mold or mildew will also help those with weakened immune systems such as a new baby or someone just coming home from the hospital. How often should you sanitize? While there is no strict guideline for how often you should sanitize your ductwork if you do suffer from asthma or allergies you might want it done every few years. If you had a flood in your home and moisture got into the duct system it’s a good idea to sanitize. Everyone is different and it depends on each individual’s household needs. A healthy home needs air duct sanitizing! All the germs, bacteria, mold, and mildew that you can’t see in your vents is certainly bad for your home’s indoor air (and for you! ), which is why we recommend sanitization for every HVAC system we clean. While you may not be able to see what’s hiding in your ducts, it’s well worth getting them sanitized! Modernistic has been keeping Michigan’s air ducts clean and healthy since 1973! Click or call today to find out more about air duct sanitizing. The easiest way to check to find out if your air ducts are dirty is to simply take a look. If you can, take a vent cover off and look at the inside of your ducts. If there is a buildup of dust and debris than it could very well be time to clean your air ducts. Be aware that the return registers in your home may not be the most accurate indicator, since they pull in dusty air and will get dustier much faster than the rest of your air duct system! While every home is going to gradually have dust settle in their duct system, there are countless external factors that can speed up the process. Living on an unpaved road or by a sandy beach can increase the amount of dirt that gets tracked into your home and pulled into your ducts. Anyone with pets will who are prone to shedding will attest that they do so everywhere, with some of it undoubtedly getting pulled into your ductwork. A little pet hair of dust in the ducts can go unnoticed for years, but if you have allergies to dust or pet dander you might find that you want to have air duct cleaning more frequently. Even new homes can sometimes need their air ducts cleaned, especially after the construction phase. Drywall dust, sawdust, and other fine particulates can keep getting recirculated through your home, making it seem like you have to dust very often. Air duct cleaning can remove the drywall dust and any other construction debris behind in the ductwork of your new home. Isn’t It Time You Checked? While there isn’t a set standard of time, there are definitely plenty of other ways to tell if your air ducts need to be cleaned. Indoor air quality is important, and it only takes 5 minutes to see if your air ducts could be the dusty, dirty culprit! To find out more about air duct cleaning, visit our FAQ page to learn more. If you’re ever unsure if your air ducts could use a thorough cleaning, you can always call Modernistic . One of our NADCA-certified air duct technicians would be more than happy to come out and take a look for you! We all want to be good hosts to our guests. While it might be impressive to fold everyone an origami reindeer, what’s really going to make you a star this season is accommodating your guests’ allergies. It only takes a bit of knowledge and preparation to make this holiday merry and safe for everyone. 1. We’re going to get a Christmas tree (and then wash it). Pine needles can trigger many different kinds of allergic reactions. The most obvious allergen they carry is pine pollen, as well as various molds, which grow as the trees sit outside. Also, a few people are allergic to the chemical sprays used in farming, or the terpene oils produced by coniferous trees. Trimming the tree isn’t much fun if it leaves people congested with red eyes and a rash. If you prefer natural greenery, gently spray and wipe the branches with a diluted bleach and water solution before you bring the greenery inside. This should remove any molds, pollen, or pesticides. Since bleach will dull the bright colors of ribbon and artificial flowers, only use water on decorated wreaths and garlands. Christmas trees are often too large to wash entirely by hand. Instead wipe the trunk, the likeliest place for mold, with a bleach and water solution. Then spray it down with a garden hose. 2. Be alert to possible centerpiece catastrophes. Floral centerpieces can be a real problem for guest with allergies and can also bring on an asthma attack. However, it’s the fragrance, not the pollen, that starts your guests wheezing and sniffing. This kind of reaction is not always a true allergy – just an uncomfortable response to a scent that can irritate the lining of your nose and throat. For an easy fix, you can substitute less strongly scented flowers. Ask your florist to make an arrangement with seasonal but unscented blooms, like holly, or amaryllis. 3. Avoid room fresheners, candles, and potpourri. Like flowers, the strong scents in candles, room fresheners, and potpourri can inflame the sensitive airways of people with asthma. Some paraffin wax candles may even release carcinogenic chemicals when they burn, according to research done at South Carolina State University. Stick to soybean and beeswax candles, and if the scent it particularly strong, blow them out before guests arrive. Avoid room fresheners and potpourri altogether. And, if you want something for ambiance, burn unscented candles at the table. 4. You may bring more than the ornaments up from the basement. The places we tend to store our holiday decorations, like attics, garages, and basements, all are prime breeding grounds for mold. When possible, unpack the boxes in a well-ventilated space. Wipe ornaments and artificial plants and greenery with a damp rag sprayed with a color-safe cleaning solution. A small amount of white vinegar mixed with distilled water, or a store-bought green cleaner, should kill any mold spores clinging to last year’s poinsettias. 5. Keep your figgy-pudding free of possible allergens. It can be difficult to accommodate guests with food allergies, but these can be very serious, even life-threatening. A considerate host will communicate clearly with people ahead of time. Ask your friends to tell you about any allergies, and check whether your planned menu will accommodate their dietary restrictions. If you absolutely can’t avoid serving something that contains an ingredient one of your guests can’t have, set up separate serving areas to avoid cross-contamination, and clearly label the different dishes. 6. Have your air-ducts cleaned before turning on your furnace for the first time. The weather is turning colder in Michigan, and we may be cranking up the heat to keep our guests warm. However, several months of dander, dust, and mold may have accumulated in our air-ducts since we last turned on the furnace. If your guests are allergic to pets, dustmites, or mildew, they may soon be sneezing and coughing their way through not-so-silent nights. Think about having your air-ducts cleaned before your holiday guests arrive. Modernistic will have your indoor air clean and allergen-free in no time at all, so that you and your family can have a happy and healthy holiday. Contact us today! Serving Wyoming, Michigan for 40 years. If dust and mold trigger your allergies, it can be hard to enjoy the comforts of home in Saugatuck. Fortunately, expert designers know how to curate home decor in a way that keeps allergens at bay—and can still be beautiful and uniquely yours. Mold and dust mites are some of the most common causes of allergy symptoms in the home. Dust mites thrive in pet dander and dust, and mold loves damp, humid conditions. If you can reduce dust and mold, you’ll reduce allergens. So where do you start? Start by clearing away clutter. You know all those toys, knick-knacks, and stacks of clutter that don’t do anything but collect dust? They collect dust. Go for a clean, minimal look to reduce the surfaces that attract dust. Some items in your home are necessary or valuable to you—children’s toys, family heirlooms, things of beauty—and you’ll probably want to keep these. To reduce dust in your living areas, consider displaying a few of these items at a time and placing the rest in storage. When the season changes or you get an itch to reorganize—or when the kids get bored with their toys—rotate a few items out of storage. Before storing them, wipe off any dust with a damp cloth and allow them to dry completely to avoid the potential for mold. Choose your furniture and upholstery carefully. Opt for light, washable curtains, leather furniture, and lamp shades that can be easily wiped or washed. Heavy drapes can look stylish and dramatic, but they collect dust and moisture, which encourages mold growth. Washing your drapes frequently will remove allergens from your home. In addition, leather furniture can be wiped down easily, making dust less of a problem than with cloth furniture. If you can, reduce the number of flat surfaces, including coffee tables and end tables, since dust will gather on the tabletops. Pay attention to humidity levels, and decorate accordingly. Aim for 50 percent humidity: Too much humidity invites mold; too little invites dust. Bathrooms, basements, and laundry rooms are notorious for high humidity, so target your dehumidifiers in these areas and use mildew-resistant paint. In addition, avoid carpet in high-humidity areas. If the hard floor needs a splash of color, go for a washable rug—and wash it regularly. Don’t let allergens drive you up the wall. You want your walls to look nice, and there are plenty of options available for allergy sufferers. For example, choose paint over wallpaper, since mold and dust are less attracted to painted surfaces. If solid colors aren’t your thing, consider painting the trim a different color or using stencils to add designs and patterns. When selecting and placing wall art, remember that you’ll want to dust it regularly. It’s easier to remove, clean, and replace solid frames that hang in easily accessible areas. Intricate, textured items and items hanging far out of reach are more difficult to clean. The gap between kitchen cabinets and the ceiling is a favorite place for dust, and most people rarely get around to cleaning this area. If you’re remodeling your kitchen, change your cupboards for ones that reach the ceiling. Plants can add life and color to any house, but if your allergies are sensitive, select them carefully. Broad leaves can collect dust, which will need to be wiped or sprayed down, and moist environments like terrariums can encourage mold growth. With this in mind, choose a small number of plants that prefer a dry environment and find decorative pots that really pop. If you’re lucky enough to avoid seasonal allergies, open windows when weather permits to encourage airflow and discourage dust. Fresh air can liven up any room! But grass and mud are another story. Keep them at bay with a no-shoes rule, which you can accent with a colorful boot tray and cheerful, effective welcome mats. Wash linens in hot water. Mites and mold don’t easily make it through the hottest cycle, and they’re even less likely to survive bleach. You can cut down on allergens in your home by washing your sheets, comforters, curtains, towels, and rugs in hot water. Allergens won’t survive this treatment, but you want your linens to come out looking great. When you’re selecting your decor, check the care instructions, and try to find items that fit your style and can retain their look after several hot-water washings. Any house looks better when it’s clean, but if you’ve got allergies, it’s even more important. A cleaner house will keep your sinuses happier. The person with the fewest household allergies should take the dustiest jobs, but if you’re on your own, you can wear a dust mask or hire a cleaning service like Modernistic. Our anti-allergen programs can reduce your home’s allergens by 90 percent, including common ones from pet dander and dust mites. However, be careful when considering renting a shampoo or steam cleaner for your carpet. Most shampoo cleaners don’t heat water to a temperature that will make a noticeable difference in the allergens in your home, and steam cleaners can leave moisture in your carpet fibers that encourage mold growth. With a clean, low-allergen home, you can relax and enjoy the atmosphere you’ve created without a stuffy nose or watery eyes. Take a deep breath in through the nose—because you can. Serving Saugatuck for 40 years. According to the American Lung Association and the EPA, our indoor air can be far more polluted than the air outside. Every breath might fill your lungs with a dangerous mix of asbestos, bacteria, household chemicals, common pesticides, mold, dust mites, VOCs, formaldehyde, or other toxins. Unless your lungs can catch a break, poor air quality will affect your daily routine for the worse. Do you or your family experience debilitating allergies, asthma, or respiratory disease? The air in your house can be taking a serious toll on your health, keeping you home from work or school, or away from social events. Ironically, the more time you spend on the couch recuperating and breathing that same polluted air, the worse you’ll feel. Is Your Job (Literally) Killing You? We all have enough trouble getting through the daily grind without worrying about whether the air in the workplace is putting us at higher risk for cardiovascular disease or lung cancer. Be alert at work, especially if you work in a setting where more pollutants may be present. See that all employees wear the appropriate protective gear, and that heating, cooling and ventilation systems are in working order. And remember that a healthy workforce keeps the factory floor running and health costs down. If you regularly experience coughing, sneezing, irritated eyes, nausea, dizziness, drowsiness, congestion, or asthmatic wheezing, then monitor your symptoms. Do you wake up after a night spent in a particular bedroom with terrible allergies? Maybe its the dust mites under the bed and in your mattress. Find yourself experiencing extreme fatigue and headaches? Be sure your carbon monoxide detectors are in working order. When bad air is the culprit, you may find your symptoms are connected with a particular location. For business owners or home owners, clean air means a better day. Whether you want a better life or just a better bottom line, every breath of clean air will help you get there. So check out our tips for simple changes you can make to improve air quality indoors. Also be sure to jot down a time for your home or business to have its HVAC system serviced. Contact Modernistic to set up an appointment today. East Lansing: enjoy Michigan color without sacrificing your health. Most Michigan residents agree that fall is the best season: the summer humidity breaks, the leaves turn color, and apple cider hits the store shelves. But for many, the changing weather can also bring allergy symptoms or trigger asthma attacks. So for those of you who are allergic to autumn, here are some strategies to help manage your symptoms. What many of us refer to as “hay fever” is actually a reaction to ragweed pollen. Late August through September and early October are high times for ragweed pollen, which can spread great distances even if there isn’t any near you. Keep an eye on the pollen forecast, and avoid going outdoors when the pollen count is high. Close your windows, and shower in the evenings to avoid getting pollen on your pillow while you sleep. You can also run a HEPA air filter in certain rooms, particularly bedrooms, to improve air quality. Damp piles of leaves are ideal breeding grounds for mold and mildew. So before you start raking leaves, be sure your mouth and nose are covered with a protective mask. If your reaction is severe, consider turning that chore over to a non-allergic friend. Consult a doctor or an allergist about the best treatment for your symptoms. Your treatment will vary depending on the specific trigger, and it’s important to know which activities are safe and which to avoid. Pollen, mold, dust mites, and dander all collect in air ducts. When you turn on your heat that first chilly fall day, you could very well circulate allergens throughout your home. If you or someone in your family suffers from seasonal triggers, consider cleaning your air ducts and air filter to reduce symptoms. Modernistic can help you manage your fall allergies. When it comes to air duct cleaning, our technicians are NADCA certified. We also offer anti-allergen and disinfectant programs to reduce allergens in your home. So stop being allergic to autumn: contact us today to schedule an appointment. Do you want to reduce pet dander in your home? Richland, you want to enjoy your pets without allergies, right? We understand how much people in Michigan love their pets. But if you, or someone in your household, struggles with asthma or pet-related allergies, owning a pet can be a struggle. Pet dander, in particular, tends to be one of the chief allergens. Try these tips to reduce pet dander in your home so that you and your family can enjoy your pets in comfort. If you haven’t yet had yourself tested for allergies, make sure to talk to your doctor. It’s possible you may be allergic to more than your pet, and if you may relieve many of your symptoms by focusing on those allergens as well. You may actually be allergic to a pollen brought in on your pet’s hair. Make sure you don’t blame your pet too quickly! We know how tempting it is to invite your pet up on your bed. But, if you or your children struggle with pet-related allergies or asthma, it’s best to keep them out of sleeping areas. It also helps to use hypoallergenic bedding, and to use a HEPA filter in the room of any allergy or asthma sufferers. If you do allow your pet onto the bed or other furniture, frequently wash exposed areas. That includes the bedding, throw rugs, and cushion covers. Bathing can reduce the dander in a pet’s fur by rinsing out dead skin cells and the allergens connected with them. While bathing your pet on a weekly basis may seem like a commitment, it can significantly mitigate allergy symptoms and lower the risk of an asthma attack. Frequently brushing your pet can also help, but you will want to ask a non-allergic person to handle this task. If you have asthma or allergies, you may have already replaced your carpeting with hard flooring. Carpet collects pet hair, dander, and other allergens. So any large, carpeted areas should be vacuumed daily using a vacuum equipped with a HEPA filter. However, even a good vacuuming won’t remove everything. Consider bringing in professional carpet cleaners every couple months to remove allergens from the deep areas of your carpet. At Modernistic, we understand that you want to live a happy life with your pet. If you need your carpets cleaned to cut down on dander, we can help. We also offer upholstery cleaning services which can help remove dander and other allergens from your furniture. And don’t forget to ask about our allergy relief program, which can cut down on allergens in your carpet and upholstery by up to 90%. Contact us today to schedule an appointment. Allergy relief is on the way. Sorry, for your allergies, Brighton: we blame the weather. After one of the driest summers on record, recent weather changes have led to a high pollen count across Michigan. If you suffer from seasonal allergies, you’re probably already well aware of the problem. Modernistic offers special anti-allergen cleaning, but here are a few tips to hold you over while you wait for help to arrive. Keep pollen and other allergens from entering your home in the first place. Close your outside doors and windows, leave your shoes at the door, and keep doormats at all entryways. Dust mites and mold grow best in a hot, humid environment. Keep your indoor temperature between 68 F (20 C) and 72 F (22 C) and relative humidity below 50%. If you haven’t changed the filters in your furnace or air conditioner in a while, you may want to check them as well. Choose one that comes equipped with a small-particle or HEPA filter. This can be especially beneficial to use in bedrooms: have it direct clean air toward your head while you sleep so that you can get a better night’s rest. Wash your bedding in hot water once a week to kill any dust mites. Also, if you have washable curtains, area rugs, and doormats, clean them as well. If your symptoms are exceptionally bad, you may want to wear a dust mask while you clean. After that, vacuum all your floors, and use a microfiber cloth or slightly dampened rag to get rid of dust built up on your shelves and dressers without brushing it into the air. Our specially-trained professionals can reduce allergens in your home for up to six months. We can remove up to 90% of dust, dander, and other debris from your carpets and upholstery, leaving you with long-lasting allergy relief in your home. Call today to schedule a cleaning.